A ride in a gondola goes hand in hand with a trip to the city of Venice. 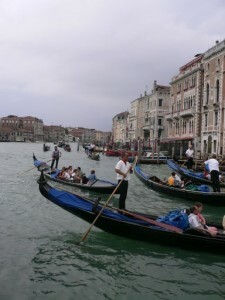 Indeed, a gondola ride is perhaps the most popular activity in this city. Before you hop into one, though, there are some things that you ought to know. Here are some tips to help you get the most out of your gondola ride in Venice. How much should a ride cost? Naturally, there are standard fares for gondola rides – these are government-mandated. A 50-minute ride should cost €62, plus €31 for every 25 minutes thereafter. After 8 p.m., the rates can go up to €77.50 per 50 minutes. The fact is that these rates are sometimes not followed, and gondoliers usually charge more. The bottom line is that you should know exactly how much the gondolier will charge – €100 seems to be reasonable. If the gondolier asks for more, you might want to look around for another ride. Also know that if you ask the gondolier for a song, you will have to pay extra. You may opt to take a ride along the Grand Canal, although this route is usually very crowded, and expert travelers suggest taking a vaporetto (waterbus) if this is the route you want to take as it is a cheaper alternative. Gondola rides are best done in the smaller and less crowded canals of Venice. These routes also provide a less touristy experience, and more of the famed romantic gondola rides. Gondolas can hold up to six people. If you want to save some money, get a group together so that you can split the fare. More so, booking a gondola ride through your hotel may be more expensive. As such, it would be better if you decided on a neighborhood that you want to explore first, go there, and look for a gondola at one of the numerous gondola stops. Gondola rides in Venice are definitely a couples thing.